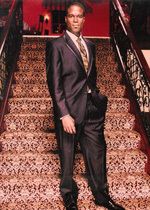 Description: Black 2 button trimmed satin lapel 100s feel fabric with matching fabric pleated tuxedo pants. Come in to customize your accessory colors! White tuxedo with matching white pants and white shoes. Come in to customize your accessory colors! 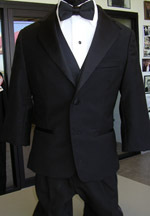 Babies� Tuxedos, 2 button notch black poly coat, matching pants, shirt, vest and bow tie.